After looking for them for months, I finally managed to find a 1-pound bag of shelled, unroasted pistachios at the Indian grocery. Of course, after all that time I’d forgotten what it was I planned to do with them, so they’ve been languishing in my fridge for a couple of weeks, tempting me to open the bag and just start snacking. Eventually they’ll find their way into pilafs and pesto, but in this recipe they add a little pizazz to breaded tofu. 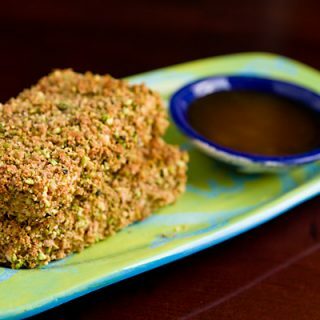 I dipped the tofu into a sweet and spicy mustard-based sauce before dredging it in pistachio-spiked breadcrumbs. The tofu was tasty on its own, but I decided to carry the sweet and spicy theme one step further and add my daughter’s favorite sauce, an easy version of the “duck sauce” found in Chinese restaurants. With so many competing flavors, it sounds like a mess, but somehow it works: crunchy yet tender, sweet yet sour, nutty yet…? Well, you get the idea. It’s a symphony in your mouth! One note: Although the photo shows the sauce in a dipping bowl, I found that it’s better just to pour the sauce over the tofu; otherwise the breading falls off, and you get a dipping bowl full of soggy crumbs. Preheat oven to 400F; prepare a baking sheet by either oiling it lightly or lining it with a silicone liner. While the tofu is marinating, place the bread into the food processor and pulse into fine crumbs. Measure out 1 cup of crumbs into a wide, shallow bowl. (Save any remaining crumbs for another use.) Pulse the pistachios in the processor until they are reduced to fine crumbs. Add them to the bread crumbs along with a generous grating of black pepper, and mix well. Put the tofu into the oven and bake for 20 minutes, or until bread crumbs are golden brown. Serve with the sauce of your choice, such as the Easy Sweet and Sour Sauce below. Mix all ingredients together well. Serve over tofu or as a dipping sauce for spring rolls, wontons, etc. why do you have advertising on your blog that promotes meat entrees/cooking? Is everyone for sale? Seems awefully counter-productive to the purpose of your website. I look @ your blog for inspiration, a safe haven from animal recipes and it kind of boggles my mind…..you go on an on about being invited to do the McDougall thing and in btwn your text is an add for chicken and brocoli alfredo….. Thank you for pointing out the problem ad. I haven’t seen it, but I’ve asked the ad company to remove it, if it exists. No, not everyone is for sale. Some of us are completely up front about everything, use our real names, and don’t create an alias just to lodge attacks and complaints. If there’s a problem with an ad, I don’t know about it until someone tells me, preferably in a polite way. It also worries me to hear that I’ve been “going on and on” about the McDougall weekend since I’ve only mentioned it twice on the internet. You must have been eavesdropping on my real life conversations where, I’m afraid, I probably have been going on and on about it! These sound absolutely perfect. Can’t wait to try them!! The pistachio/sweet/sour combo is amazing. Love your blog, love your recipes (ads or no ads). I clicked on the comments section to tell you that your pistachio tofu looks absolutely divine, but I now also want to say that you really are very polite/kind. That first comment was very rude. If someone has such a big problem with your blog, then they don’t need to read it. They aren’t being forced to do so, and have no business to make rude comments. Your response was extremely polite, which is commendable because I know I would not have been able to produce the same kind of response. Happy Monday! The pistachio tofu looks wonderful. A whole bag of pistachios in my house would be a dangerous thing, I’m afraid. Sounds like you have some good ideas for yours. And thanks for the sweet & sour/duck sauce recipe, I LOVE duck sauce and never thought to make my own even though I know what’s in it. I even have apricot jam in the fridge! This is just my kind of meal! I love the sweet, salty, tangy blend in my mouth. Thanks for posting! This looks and sounds delicious and I think my kids would like it which is a bonus! I love pistachios, eat them several times a week right out of the shell but never thought of them as a breading for tofu. Very clever! PS – Love the dish. Tofu never looked so beautiful! Susan, this looks absolutely delicious, and I admire you for the way you responded to “Hamish22″‘s comment. I’ve never seen ads that go against the principles of veganism on this blog and I remember you saying that you actually asked to arrange it this way. I live in the UK, so I’m not familiar peach preserves or All-Fruit spread. Would peach jam/jelly do? I’ll definitely try making this! Dominique, preserves are like jam with more whole fruit in it, so feel free to use either jam, jelly, or any fruit spread. Wow! This looks yummy! 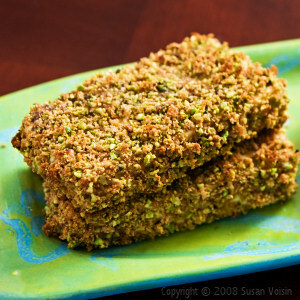 I love tofu crusted with anything…but I also love pistachios! If (any hopefully when) she makes it, I’ll write back and let you know how it came out. 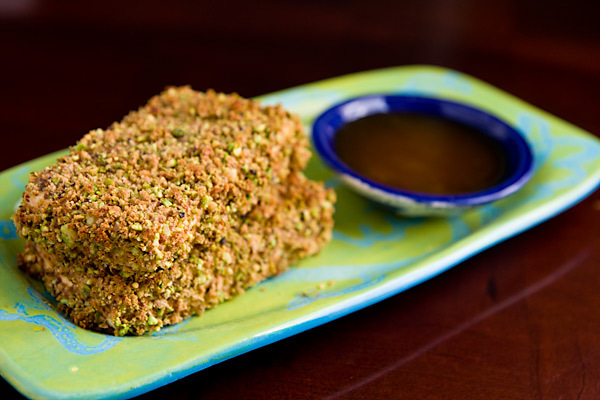 Pistachio crusted tofu with a tasty dipping sauce sounds good! this looks amazing!when i saw it i thought youd gone on a deep-frying frenzy but then i realised it was baked- looks delicious and very tempting. re ads: your response to hamish22s comment was very diplomatic indeed!i have also noticed some strange/inappropriate ads on your blog (recently one for a shooting/war video game), but i always found them kind of humorous in their silliness. everyone knows that you arent interested in that kind of stuff and chances are that th people reading your blog arent either- so its kind of a waste of an ad- id rather an ad for hamburgers be on fatfreevegan where it wont do any harm! Lane, agave nectar will work fine for anyone who doesn’t like maple syrup. Kathy, thanks for your perspective. I truly don’t understand vegans who choose to chastise other vegans for their choices; they make us all look judgmental. We take enough criticism from omnivores without heaping it on each other. Susan this looks and sounds great, but I’ll have to hide the pistachios- I wanted to make scones à l’eau de rose & pistache, and when I went to get them from the cupboard, they were gone! So I used almonds instead…(think my husband got snacky). I am a bigger fan now since reading your gracious response to Hamish. You rock! Wow! This looks fantastic! I’ve been having some problems cooking with tofu, as I live in Japan and the only tofu available is the super soft or silken kind, so I have to press it like mad. But this is a really great idea…I might try this with the pecans that are lurking in my fridge. I cooked this last night, and it was amazing! My husband deemed it his new favorite meal, with your tofu jambalaya being knocked down to second place. Thanks for the yummy recipie! Susan, this recipe looks/sounds absolutely fantastic! The pictures alone are gorgeous! Maybe my kids will finally eat tofu! Yum! I made this last night with Cashews for the family I work for and they raved!!! Served it with Black Rice, Roasted Cauliflower and stir-fried Asparagus & Shitake mushrooms. Yum. This looks great! I have just about every kind of nut other than pistachio lying around my kitchen. What other nuts do you think would be a good substitute for the pistachio in this dish? I think cashews, almonds, and pecans would all be good. looks great! and i love that its a recipe without onion and garlic…two things i don’t eat and that vegan/vegetarian food seems to be laden with. there are other flavors in this world. thanks for appreciating that. This is not only beautiful (but aren’t all your end products) but something I’m raelly impressed with. How simple but savory and fabulous! You’re my try inspiration Susan! I made this recipe last night and it was fantastic. It cooked up beautifully and even looked like the photo. I served it with some amaranth and roasted asparagus (which went into the oven for the last five minutes of the tofu baking time). Thanks Susan! Hey Mary, I did exactly the same thing–roasted asparagus along with the tofu. I used polenta as my grain, though, because I ran out of time for anything else! That’s it, it’s official- this is on my list of dished to make. I always have pistachios in my house, and now I have a delicious use for them! Thanks for both the tofu and the sauce recipe! Oh my goodness. If my husband gets wind of this recipe, there will be no rest until we make it. He is a pistachio nut (I couldn’t resist the pun) and we just enjoyed a tofu dish tonight that was breaded, with a dipping sauce on the side. Thank you for posting this – I’m off to save the recipe. And you are professional, warm, and inspirational. Disregard the negativity! I just made this tofu for dinner and it was delicious! I didn’t have any pistachios so I used ALMONDS… Mmmmm… I topped them with plum sauce and I was happy! I just found your blog and it looks great. I can’t wait to try out some recipes! I love to eat as vegan and good as possible and every recipie I’ve browsed seems really good. I also like the format, it’s easy to navigate and i really like the pictures. You describe recipes in a straightforward way that makes sense. Thank you and keep up the good work! I haven’t been at all inspired to cook lately, but this recipe will get me back into the kitchen–thanks for it! i love things that are encrusted. especially with ingredients as delicious as pistachios! This looks wonderful. I fear, however, I’ve gained a few pounds from my recent pistachio addiction and as soon as I had polished off that bag, I swore to myself it would have to be a long (LONG) time before I bought another one. However, when I do finally cave in, this is the first thing I’m making! Aw man, i’m trying to make the commitment to raw veganism and you post this recipe ;p.
Tofu is my raw achilles heel, as for adding pistachios and yummy sauce with the mix of flavours and textures, well let’s just say it’s lucky i’m only aiming for an 80% raw diet ;). I look forward to trying this soon. What an unusual idea! I must say at first glance that I thought it was once of those nut-covered chocolate ice-cream bars. I’d love to try this out, and luckily there are many Indian grocers in Ottawa. I just made this for dinner (picked up pistachios specially even though they were overpriced here in Japan) and it was delicious!! My boyfriend kept saying what a creative recipe it was and I promised to show him your blog so he can see more creative recipes. Thanks so much for all your recipes and stories, and for being so real in a medium where many forget to show the consideration they would probably show automatically in face-to-face interactions. I like this recipe very much. Easy, quick, full of nutrients and surely very tasty. Thanks. That recipe looks so delicious – and easy to make! when I saw the picture, I expected it would take more work to make this. Now I just need to try it! Hi Diane! I’m looking forward to meeting you at the McDougall weekend. Please do come up and say hello; I won’t be doing my presentation until the last day, Sunday, at 8 AM, so I will have plenty of time to chat. I’d love to have only ads for vegan, “green,” earth-friendly, and organic products but so far I haven’t been able to find a ad network that is that specialized. When I find one, I will happily make the switch. I hate that it might even appear that I endorse non-vegan products! My wife is allergic to nuts, so we experimented with this recipe, substituting Matzah Meal for the nuts and Honey for the Maple Syrup (because we didn’t have any). I don’t know how it compares to the original recipe but it was very very tasty and was promptly added to our list of favourites. Susan, thank you so much for this recipe! I made it for dinner last night and we enjoyed it very much. The thick maple syrup-mayo coating really helps to glue on a thick layer of the nut-crumb mixture, resulting in a wonderful crunchy crust. So good! My internet was down when I wanted to try this technique, so I had to do it from memory. I the followed the technique of marinating the tofu, coating it w/ a thick sauce, then dredging it in breadcrumbs, but used completely different ingredients. It was amazing! It tasted like vegan chicken nuggets, but healthier and softer. Such a simple, creative recipe, Susan. I've been following your blog for about a year and half now, but this is my first time commenting. This is the very first recipe that attracted me to your blog, but somehow I had never gotten around to trying it yet (I've tried lots of your other recipes, though!). I finally made it tonight and it was a huge hit! My partner and I both loved how easy it was to make, and how nicely all the flavours worked together. Thanks and keep up the delicious work! I made this delicious recipe when you first published it, and I've been thinking about doing it again. I've read over the comments and have a hint that might help other pistachio addicts in their efforts not to eat all the nuts at once. I was able to find shelled pistachios (even more dangerous than in-the-shell) but I just keep them double bagged in the freezer, under stuff. This may not work for everyone, but so far I've managed to retain my pistachio supply for more than a year. And of course the freezer keeps 'em fresher. Thanks, Susan, for your wonderful blog. Wow- amazing tofu! Usually I only have amazing tofu when I eat out, but I can’t believe how great this turned out for home-cooked tofu! Obviously I haven’t mastered tofu on my own just yet. I froze my tofu first, then let it thaw, to give it a meaty texture. I also used wasabi peas in place of the pistachios because I have a bunch of them on hand. I couldn’t taste any wasabi hotness in the final product though. This is going to be a regular in my house now. Thanks! Thanks again for another great meal idea! I love your blog…. We have only be vegetarians for about 4 months now so you site has really helped me keep my hubbie interested! One of my fav recipes of Susans. I give it 5 stars and make it often! Thank you once again for a great recipe. I vote for you on every “best of” list!!!!!!! This looks awesome! I can’t wait to try it! Please keep the tofu recipes coming! I love tofu and don’t have many recipes yet 🙂 the question I have is do the pistachios have to be unroasted? #2 – I’m not concerned about the ads…it’s the internet! My motto: don’t look at what you don’t like (problem solved). #3 – Can’t I just use roasted unsalted pistachios? They are readily available at trusty Trader Joe’s! Thanks, Pam! You can try it with roasted pistachios, but I’m not sure how it will work since I’ve never used them for this. Good luck! I am using your recipes and doing the current Weight Watchers program, PointsPlus 2012. I appreciate that you include the nutritional information so that the points can be calculated under the new system. Under the new points system, the crusted tofu recipe is actually 7 PointsPlus values, which is still a great value and perfect for my lifestyle. Thank you for doing what you do on this blog. I made this for dinner tonight and it is so good! It tastes amazing and looks so pretty like something from a fancy restaurant. The thick sauce makes the tofu so flavorful and everything held together beautifully even through the perilous transfer from the baking sheet to the plate. Thank you for the recipe, your blog is a new favorite of mine! So good! I used millet bread and tamari to make it gluten-free and I used peanuts instead of pistachios (personal preference). Easy and mega tasty! Wanted to thank you for this recipe. I’ve made it for several Thanksgivings, and again today. Now that I’m gluten-free I swap out gf panko for the bread, and it turns out great! My daughter has been craving this dish ever since I saw it on your sight. She is not a big fan of hot or spicy food. Does the Spicy mustard make it pretty hot or spicy? If yes, could I use regular mustard? I plan on making this tonight. Thanks in advance for your answer! I don’t find it makes it spicy, but if there’s any chance your daughter might, I would use regular mustard. I hope you all enjoy it! YUM! I made this tonight, using tempeh. I’d braised the tempeh in water with tamari & cooled before proceeding to the sauce & breading. Dear Husband asked me to print the recipe so we’ll be sure to make it again. thank you Susan – your blog, your recipes are the best! Certainly, the ones I use most often. This looks great! Just a couple of questions, what type of tofu did you use? firm? and the mustard, is that a powder? I use extra-firm but firm will also do. The mustard is the prepared kind, like used on sandwiches. I used a spicy kind.